There's nothing players love more than options. No two Magic games play out exactly the same way—many times even if you draw mostly the same cards. A single move or change can set off a cascade of resulting decisions that make every match feel unique or novel. From the number of lands you have to your life total to the board state of yourself or your opponent, there's no telling what you'll need from game to game. As a result, cards that offer flexibility and options are a luxury in Magic that everyone enjoys and seeks out. That's where split cards come in. Or, more accurately, come back. Originally introduced in Invasion—though first imagined for the then-unnamed sequel to Unglued—split cards have always been popular with players and shown up again and again through the years, from the original set with cards like Wax // Wane and Assault // Battery to a reimagined take on the split with aftermath cards in Amonkhet. They keep coming back for a reason, and so long as they do, players will be lining up to play them. Let's talk Guilds of Ravnica. One of my personal favorite aspects of split cards is the naming convention. In the past, they've typically been two-word phrases used together, but in our latest trip to Ravnica, each half of the split card has the same first three letters. While this doesn't really change anything about the mechanics or gameplay of the cards, I do appreciate the commitment to consistency. We know players love split cards for the options they allow, but what makes split cards stand out from other scaling mechanics like kicker or flashback? Well, the beauty of split cards is that rather than get one effect up front and possibly an upgraded effect later on, the split cards of Guilds of Ravnica give you two completely different options. Take Response // Resurgence, for example. 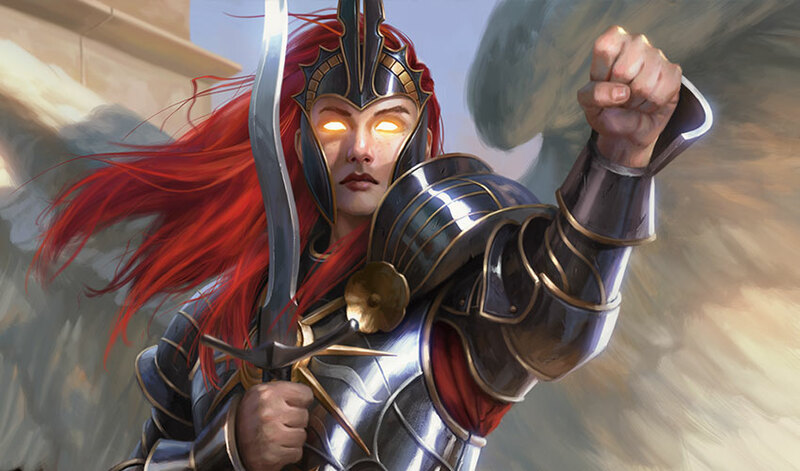 Response is a completely reasonable combat trick across pretty much any format, and it's easy to cast—by the way, hybrid mana is making its own return—and you'll never feel bad using it as a removal spell. In creature mirrors, that's always going to be a useful ability. But what if you're paired up against a control deck running few or no creatures? Scaling up the effect if you had more mana available wouldn't matter—but getting a completely different effect instead? That's the kind of versatility that split cards offer that pretty much nothing else in Magic can match. And what an option that is with Resurgence. Bogged down in a board stall and need to break through? First strike alone will do that, but Resurgence doesn't stop there. Vigilance means that your team will still be available to block on the next turn, and first strike means your creatures are likely going to survive until that next turn. Of course, your opponents might not. 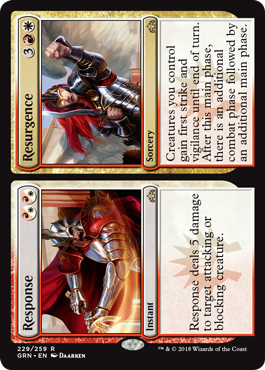 Did I mention that Resurgence also gives you an additional combat phase? Facing down a control opponent where Response doesn't do much? Well, I guarantee an additional combat phase sure will. First strike, vigilance, two attacks—all at the cost of just five mana. That's a powerful card no matter how you slice it (and the Boros Legion will be doing plenty of slicing and dicing in Guilds of Ravnica), plus it comes on top of an already strong play in Response. Putting both effects into your deck at the cost of just a single "card" is incredible value, and I suspect that Response // Resurgence will be making appearances across the known Magic Multiverse, from Standard to Commander alike, where the words "additional combat phase" are often synonymous with winning the game. Moving on to my favorite guild making an appearance in Guilds of Ravnica, Find // Finality is a card perfectly fitting the Golgari. Raise Dead is an effect that's been in Magic since the very beginning, and Find is a wonderful homage that comes with additional upside. For starters, it's a built-in two-for-one (meaning you'll get two cards to your hand in exchange for one), and we're not talking two random cards, we're talking the two best creatures in your graveyard. That's good in any fair game of Magic where your creatures fall in battle or to opposing removal, but c'mon, this is the Golgari Swarm we're talking about—you know there are going to be plenty of other ways to get creatures into your graveyard. You can use creatures in the 'yard to fuel your undergrowth shenanigans and then bring them back to your hand for value with Find. But what if you need to get rid of creatures instead of getting them back? Finality has you covered. Creature-pump-meets-Languish is a fascinating design, and it's easy to see how it will typically play out—you pump either your best creature or take a creature to 5-plus toughness and then clear away everything else, leaving the board clear other than your newly buffed creature. And even if you do lose some of your own creatures in the process, that just means your next undergrowth card is going to be all the more terrifying. Options. That's what the return of split cards in Guilds of Ravnica brings with it, and both Response // Resurgence and Find // Finality come with the right amount of flexibility to find a home in many different decks. They'll play a different role every time you draw them. They're guaranteed to keep games interesting—as if guessing what your opponents had in hand wasn't already hard enough—and will be a blast to watch play out as we return to Ravnica.